Cat Stevens was inducted into the Rock and Roll Hall of Fame in 2014. A true seventies singer-songwriter - Cat Stevens gave hushed, mesmerizing performances. 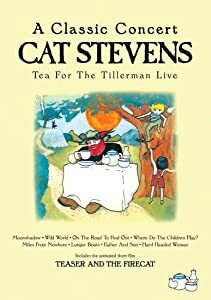 All books on Cat Stevens can be found here. All audio on Cat Stevens can be found here. All video on Cat Stevens can be found here. With the hit single Wild World entering the US charts in 1971, Cat Stevens flew to America to visit KCET Studios in Los Angeles where this intimate concert, which features the best of his repertoire at the time, was recorded. This live, rare classic performance, in its simplicity, captures the warmth of his studio recordings, but with even more passion and depth. All archival items on Cat Stevens can be found here. Series I: Papers contains class assignments, unpublished textbooks and supplements, lesson plans, publication and use permissions, newspaper clippings, and a number of subject files related to musical genres, social issues, poets, musicians, and musical groups. Of note is a file of correspondence with letters from various artists. The files are arranged alphabetically by type, with subject files on various artists at the end of the series.